Voters’ support for law and order is growing as the death toll from the post-2014 murder spike nears 1,500. The murder toll is highlighted in a new survey published by the Major Cities Chiefs Association (MCCA), which reveals that 2,308 murders have been committed in their cities during the first half of 2016, versus 2,001 in the first half of 2015. That’s a huge 15 percent increase, coming after a roughly 17 percent rise in the nation’s major cities during 2015. In 2015, the association reported 6,192 murders in their cities, up by 837 from 2014. 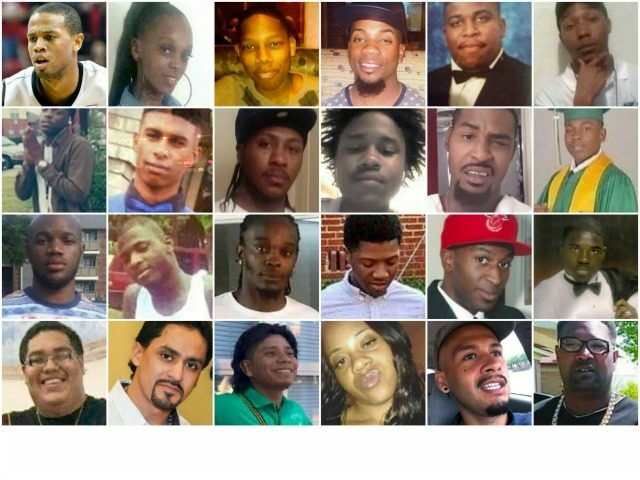 That increased 2015 murder rate will have added roughly 300 dead to the first six months of 2016. Then add the 307 deaths that comprise the additional 2016 increase, creating an estimated death toll of roughly 1,500 dead Americans since 2014. The crime wave is happening as President Barack Obama’s “stigmatize-and-federalize” push against local law enforcement is being blamed for the death toll by many cops. For example, the murder rate has shot up in Dallas, which Obama has repeatedly praised for embracing his policing rules. The image above shows Americans who were killed in Dallas during the first half of 2016. The death toll does not count how many Americans have suffered from the loss of loved ones and how many more beyond that disrupted by violent crime afflicting their communities. Nor does it break out the casualties from high-profile cop executions at the hands of black militants, from deadly Muslim terror attacks, or from illegal aliens emboldened by the Obama administration waving off immigration laws have accelerated since 2014. That’s a massive increase from 39 percent in 2014. In October 2015, the same month the Senate Judiciary Committee introduced a bill to slash prison sentences for all drug traffickers, Gallup found that 70 percent believed crime was on the rise. Republican presidential nominee Donald Trump tapped into these concerns with an electrifying nomination acceptance speech at the Republican National Convention. Trump’s speech sent nearly every leftist in the media into hysterics, not the least because it resonated with a significant segment of the electorate. A CNN poll showed that 45 percent of respondents felt Trump accurately described “things in the United States today,” regardless of how they planned to vote. Whites say his speech reflected their feelings about the country by 52-41. Non-college whites say this by an overwhelming 60-34. White evangelicals say this by 73-22. But white college graduates say Trump did not reflect their feelings about the country by 53-39. Trump’s position puts him at odds with the GOP platform, which allows Republicans to cut a deal with Democrats to release dangerous drug traffickers back into ailing communities — including illegal aliens working for large criminal enterprises such as Mexican cartels — in exchange for more leniency for white-collar businesses executives accused of violating federal regulations. But some Democrats want the total abolishment of mandatory minimum sentences and refuse to budge on the mens rea leniency reforms. The Democrats’ no-concession strategy hasn’t deterred prominent Republicans from rolling over, though. While the prison break bill has stalled in the Senate, House Speaker Paul Ryan plans to take it up in September, putting him, Trump, and voters on a path to a possible showdown. Trump enjoyed a large post-convention boost, which gave him an astonishing 39-percent edge over Clinton from the white working class.